Namco Bandai has launched a lawsuit against Witcher 2 developer CD Projekt Red over European publishing rights - and because the studio removed the DRM from the game without its permission. 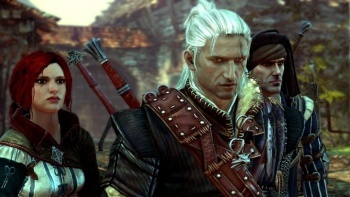 The distribution deal for the hit RPG The Witcher 2 is a bit of a complicated thing. Namco Bandai handled European publishing chores for the PC version of the game but THQ recently announced that it will take care of the Xbox 360 version of the game in Europe when it comes out later this year. Atari is publishing the 360 version in North America; Atari Europe, to confuse things a bit further with not-really-relevant trivia, was recently acquired by Namco Bandai. Long story short is that Namco isn't happy with the situation, apparently believing that it should have had first dibs on the game, and has thus filed a lawsuit against CD Projekt Red parent company Optimus SA. It'll probably all come out in the wash once some money gets spread around, and the ins and outs of publishing deals aren't all that terribly interesting either, but what I do find interesting is the part of the lawsuit claiming that CD Projekt Red broke its contract with Namco by removing the DRM from the PC version of Witcher 2 without its say-so. CD Projekt, in case you've forgotten, released a patch that removed all DRM from the game just over a week after it came out, saying it had served its purpose in preventing pre-launch leaks and was thus no longer needed. It's impossible to say how, or even if, that move impacted sales of the game, but while it was a great PR move for the studio, Namco Bandai is apparently not too pleased about it. CD Projekt Red CEO Adam Kicinski expressed confidence that his company would ultimately prevail in a court case and even seemed remarkably sanguine about Namco's decision to withhold roughly $1.75 million in payments because of the dispute. "Our liquidity situation is very good. Therefore, the lack of a few million does not have any leverage on current activities. Withholding of payments means only that for some time, our partner will have to give us the money with interest," he told Polish site CD-Action [Google translated]. "I hope that the whole thing will end pre-litigation settlement. If [not], however, I am convinced we will win the case and then the loser will pay for our lawyers." "Then the loser will pay for our lawyers." It's like the 21st century version of hearing the lamentations of their women. I think I like it.